The easy cop-out would be to say this comes from our education, at least four but increasingly more like six years of study. Sure that is some of it, but the reality is that no matter what you learn in a classroom setting has little to do with what we do on the “ground” in our profession. The more complex and reality of the preparation we do comes from experience and adapting. Constantly thinking of what could happen — and we don’t want to happen — and how to react in those situations. The first time I dealt with a sprained ankle in a game situation was combination of nerves from determining if my evaluation was solid and sufficient to making a decision about returning to play no matter the wishes of the player, coach, parent or situation. Over the 15+ years this type of situation has become almost second nature, although you will still see something you have not seen before, again the need for preparation. A sprained ankle is not mundane or a non-issue for the person that was inflicted with the injury and I don’t mean to make it seem that way but there are many things we prepare for we never hope to see in our careers that are life changing. For example, a heat illness emergency where seconds matter. If you have not prepared for this mentally and physically how can we be expected to perform what is necessary to potentially save a life? As Mike Hopper put in his succinct and spot on post we take the time so you don’t have to concern yourself with it. YOU PERFORM. All of our preparation frees others from doing their job. Once again the obvious example is the athlete doing their given sport and not worrying about that bum ankle because we have a great tape job on it. Or, the athlete returning from a concussion that has gone through the rigorous return to play protocol to ensure they are safe to play at their top-level. However, we affect much more for the athlete and others. For the athlete, if they are not 100% or giving 100% the chances of re-injury or a new injury associated with the first (also known as a cascade injury) is high. Our preparation in rehabilitation, or prevention, or education, can give the athlete the confidence they need to perform worry free. The other, not often thought of, people this impacts is wide-ranging: coaches, parents, administrators, officials, emergency rescue crews, doctors and the general public. 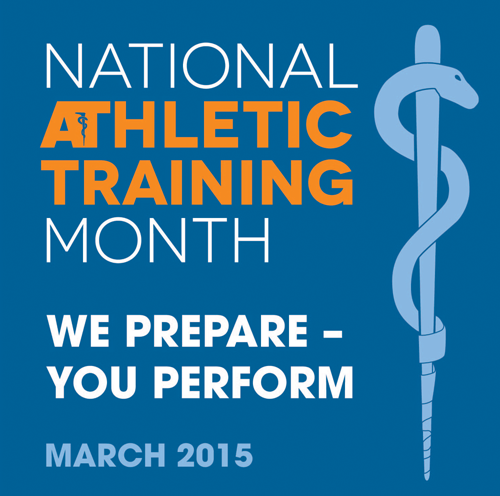 Lets now take a look at how athletic training goes way beyond just what you see on the fields and courts. First the coaches. With athletic trainers around the coaches do not need to devote time and energy to injuries they are a) not qualified/trained to handle and b) focus on their task of coaching a team or player to success. Many times we hear, see and experience the gratitude from coaches more often than the horror stories of a small minority that take umbrage with our actions. It is out job to protect the athlete and in turn protect the coach who is often the sole individual with ultimate responsibility/liability of the athlete. Our preparation allows them to perform. Parents can be parents. Athletic trainers on the sidelines or at practices allows parents to worry less and lose time and money to injuries that will happen with any sport/activity. Because of our vast knowledge and evaluation techniques we can easily save an unnecessary visit to an emergency room due to something that could wait to go the next day. Or our preparation with the local doctors could save time and costs from an unnecessary visit to a general physician that will end up referring you on anyhow. Parents can be there to support and comfort their child in the stressful time of injury. Our preparation allows them to perform. Administrators, in schools and in business, should not be concerned with the well-being of athletes, they should be concerned that those they are in charge of are being taken care of in times of need. Athletic trainers not only can communicate and identify potential issues, our preparation often times allow admins to be proactive instead of reactive. Having “been there done that” or “experienced by a peer in the profession” allows for admins to devote time to what they are charged with, keeping the system running smoothly. Our preparation allows them to perform. Officials have so much on their plate and often under-payed for the stuff they deal with. An athletic trainer may be looking at the weather days ahead of an outdoor competition to prepare for possible issues that may arise with lightning or heat/cold. When officials begin a game they become the last line of defense in the protection of the athlete on the game field, given the task to adjudicate the contest but also be aware of potential safety problems. Having us on the sideline with a good working relationship can lessen the stress of at least weather conditions. Our preparation allows them to perform. Emergency medical crews often are running from one place to another and deal in constantly varying conditions and situations. Athletic trainers on the site of an emergency can not only help the transition of care but the communication in a vital time for the athlete. When fully stocked the athletic trainer with good help can have a patient all packaged up and ready to go for advanced care, lessening the time for transport and increased chances of a positive result. I would also like to mention that we not only write but practice emergency action plans that allow for entrance and egress from all facilities that an EMS responder would need. Our preparation allows them to perform. Doctors have a job to do, doctoring (ha), depending on the provider it’s either to clear life threatening issues (emergency departments) or to rule out a skin infection. An athletic trainer has the knowledge to identify what would be serious to the mundane but important to the safety to the masses. Getting the issue to the proper provider can increase results and decrease time spent with a doctor; not to mention an athletic trainer is a good source for new patients. Our preparation allows them to perform. The general public is hard to wrap your head around, but think of it this way; our ability to educate can lessen the confusion about a specific injury all the way to how a situation is viewed. The best example of this is concussion education. An athletic trainer can hold a public forum to answer questions as this injury relates to some specific sport or even life. The general public does need to know about things that relate to sports and injuries so there is a common understanding and even appreciation of what is going on out there. Our preparation allows them to perform. In an essence, the athletic trainer is the glue that holds this thing together (OK I am a bit biased about this, but I don’t think this is overstating it). Most if not all of us do this in a relatively anonymous fashion to boot. It is only fair that during the month of March everyone gets the chance to grasp how important, we as athletic trainers, are to not only what you see, but what you don’t see.